The world keeps turning and so the collection of Eric Knowles is slowly being beaten into submission! At long last I have been able to make a start on the late 17th and early 18th century cavalry list and am aiming to have this ready over the Easter long weekend. In the meantime though the small amount of AWI figures - a mere couple of hundred or so - Eric had acquired have been sorted and are currently on eBay awaiting a buyer. Once I have the cavalry listed I shall then be doing he same for the infantry now that the Foundry and Minifigs have been separated out. the remainder appears to be a mixture of Essex and Dixons and still accounts for a couple of crates worth. If I have learnt one thing from this process it is that separating out figures by the manufacturer is probably what I should have done in the first place. 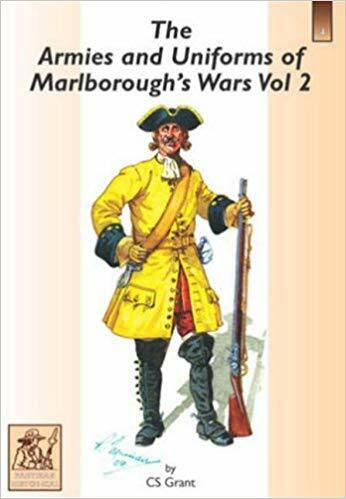 The several hundred Wargames Foundry Marlburians were easy enough to identify and as they are largely generic it made perfect sense stripping them out of their original units. Essex and Dixons have a surprising amount in common in some cases and bearing in mind my relationship with buying 28mm figures has been minimal over the years it is no surprise I have spent so much time on this. I am not for one minute complaining though! The famous Hinchliffe blue box. Eric has used hundreds of this for his units and they are so old that the corner tabs have lost all adhesion so when you take the lid off the box falls apart! The man cave is littered with these small brown tabs! Mention of Hinchliffe reminded me of many things from my early wargaming days. 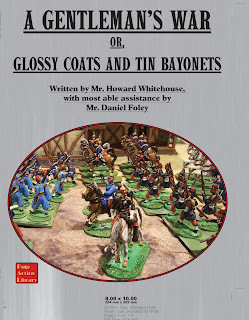 The first metal figures I ever purchased were some Russian Napoleonic infantry advancing in greatcoats - even then I was looking at ways I could make my painting life easier! - and wearing forage hats. There were twelve figures originally and I was quite shocked when I purchased the next twelve as they had been completely redesigned and were huge by comparison! I also remember buying Russian Cuirassiers, Hussars, the inevitable Cossacks and some Moscow Militia. I painted them all (except the Hussars that Chris Hardman painted for me) and along with the aforementioned infantry as well as the grenadier units and gun crews I acquired from Tradition, it formed a useful force of around a hundred foot and thirty odd mounted. When I moved to London (this would have been early 1978) and joined the former Newham Wargames Club and discovered that nobody played Napoleonics I sold them on to Eric Knowles himself. I am unsure if these are still in the painted part of his collection but who know? I rather liked the later Hinchliffe models as they seemed to have real character about them whereas Minifigs always seemed a little soulless. I still think that today although Minifigs have a look about them that satisfies a specific need. 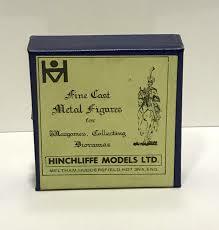 I was hugely delighted to see that Hinchliffe are in fact still available courtesy of Hinds Figures and the prices are pretty modest as well - far cheaper than Minifigs. 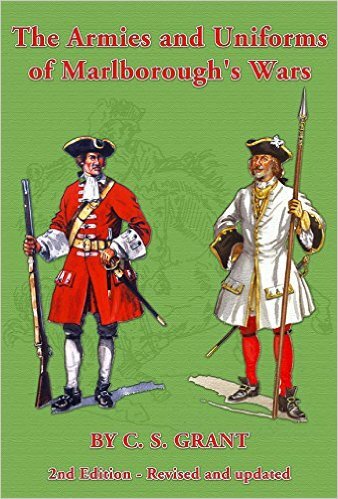 Eric has used a goodly smattering of Hinchliffe across his Seven Years War armies as, if memory serves me correctly, they were one of the later 'large' ranges. 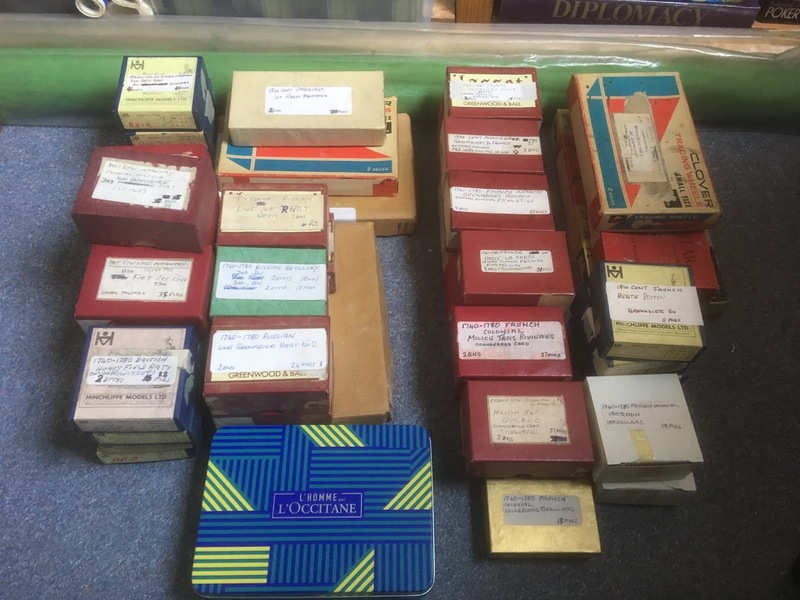 I am pleased that progress is being made with this portion of Eric's collection and the resultant trips down memory lane have been very enjoyable although I am conscious of the fact that I need to do something of my own as well. "A beast approaches, and it was King Leonidas himself who provoked it." The climax of the film 300 - the Spartans and Greeks have been betrayed by Ephialtes and are now surrounded by the Persian host. 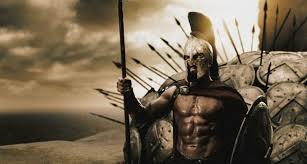 A beautiful death and immortal glory awaits Leonidas and the remains of the 300. Now I know as well as the next man that the battle of the 300 Spartans as depicted in the film 300 bears little resemblance to what actually happened but it is a great film all the same albeit in a comic book over the top kind of way. I thoroughly enjoyed it, 300: Rise of an Empire less so but it was still a worthy effort. Anyway, the long and short of it was that when the recently launched game by Footsore Miniatures (the company formerly known as Warbanner until the Evil Empire took a degree of umbrage…) Mortal Gods, covering skirmish level games in the Hoplite world (set after the Persian war), then I was always going to take a look at it! So I did and immediately picked up a copy. The game contains 32 28mm plastic figures from the Victrix range for the period so there are armoured and unarmoured hoplites, peltasts and slingers. I had a few problems with some of the figures as the box they come in has very little in the way of packaging so the heavy components – two decks of cards and bags of dice and stones have plenty of room to roll around. A quick phone call and all was sorted so some replacement figure sprues are winging their way to me. 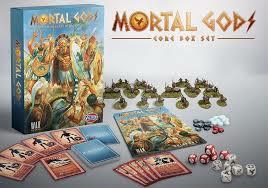 “Mortal Gods is a skirmish tabletop game played with roughly 15-25 models on each side. Players select their warriors before each game based around a single heroic leader, or ‘Lochagos’, and a number of loyal companions and heroes forming a single Lochos (war band). To be honest I certainly like the look of the game and there are a few folks at the club that are into this which is useful. However, in my usual way I am looking beyond the obvious and so will be expanding the figure collection to eventually produce a couple of forces the new Osprey rule set Men of Bronze – which covers hoplite warfare with forces around 50 to 80 figures per side. Obviously DBA could feature as well as the Portable Wargame or even Command and Colours should the need arise. There are also plenty of Greek mythological figures around so Dragon Rampant or HoTTs may even feature. My plan originally was to put this way down the batting order but it is very tempting to crack on with it as the figures are really nice and with a myriad of uses. The latest edition of Chris Peers excellent rule set covering wargames set in 19th century Africa. 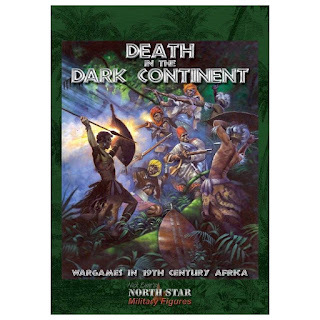 As a long time fan of the adventures of Allan Quartermain as well as various periods of African history - typically anything Colonial through to the Great War - having a set of wargames rules that focused on the 'Dark Continent' was always going to be of interest. It is true that games set in this theatre could readily be undertaken using The Men Who Would Be Kings but these rules are far more specific in their approach. To begin with there are a pretty comprehensive selection of army lists for the European powers as well as the various tribal opposition. I like this approach as it creates a closer feel for the period as well adding to the variety of potential opponents. The terrain as well as the diverse flora and fauna of the Dark Continent is also addressed which adds greatly to the all important flavour. 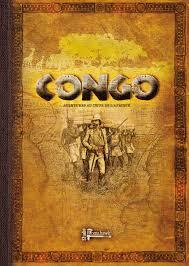 In many ways I see this set of rules as a logical step up from Congo which is almost at a role playing level. A great set of rules for low level skirmishes and almost role playing. There are some quite superb 28mm figures available for this genre and of course the subject matter lends itself nicely to smaller armies. I have in mind a couple of ideas for use with Death in the Dark Continent although they are a long way off as the project list currently stands. 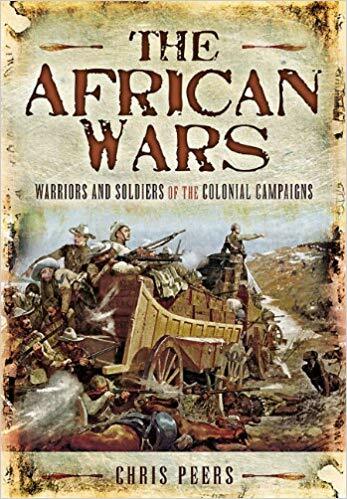 My knowledge of the various African campaigns in the latter half of the 19th century is limited in both scale and scope to the usual suspects - the Zulu War, elements of the Sudan campaign (included purely as it took place on the same continent! ), some of the French adventures and the Great War so when I saw that Chris Peers had written a book that serves as an excellent reference source to his rules my only questions was how soon could I get a copy? 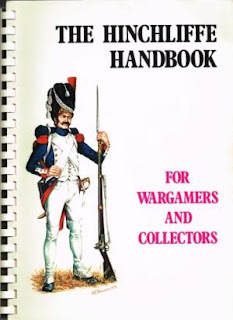 By no means a definitive work but a very useful overview all the same with plenty of inspiration for wargamers. "In The African Wars Chris Peers provides a graphic account of several of the key campaigns fought between European powers and the native peoples of tropical and sub-tropical Africa in the late nineteenth and early twentieth centuries. His pioneering and authoritative study describes in vivid detail the organization and training of African warriors, their weapons, their fighting methods and traditions, and their tactics. He concentrates on the campaigns mounted by the most successful African armies as they struggled to defend themselves against the European scramble for Africa. Resistance was inconsistent, but some warlike peoples fought long and hard - the Zulu victory over the British at Isandhlwana is the best known but by no means the only occasion when the Africans humiliated the colonial invaders." Certainly worth adding to the collection for some ideas. Once again it has been a busy weekend although not with Salute featuring for yours truly. To be honest the gaming budget had been well and truly blown beforehand (see Red Alert and the above, not to mention a couple of books) and so this year going to the UKs premier gaming day was never likely to happen. I enjoyed last year, mainly because of the novelty value, but it was hard on the left ankle, knee, hip and wallet as well as the malodorous effects of the awful lighting. When I left the Excel – around 1pm as I recall– I felt worn out and ached in places I had forgotten I had (not to mention gaining a screaming headache) but, it must be said, with my gaming mojo for the most part satiated. There have been numerous blog posts from those that attended that have mentioned the same to a lesser or greater degree - perhaps our collective advancing years and the occasionally expanding waistbands are a little less forgiving than our previously more youthful selves! For the most part Salute is a little on the large side for me - I prefer a rather more leisurely pace for my browsing these days - so I will stick to the smaller events I attend although as previously mentioned, I suspect I will brave the Excel again at some point. There was a lot of sorting out over the weekend and much progress has been made with Eric’s collection. The Foundry Marlburian Infantry has more or less gone so the next step is to tackle the cavalry – most of which is Front Rank – and the other infantry and artillery (actually gunners – there are no guns to speak of). I have taken out the Minifigs and Hinton Hunt/Higgins figures so what is left seems to be mainly Essex and Dixons. I have seen some Hinchliffe figures in the mix and also some that are unidentifiable so this will be an interesting exercise for sure. 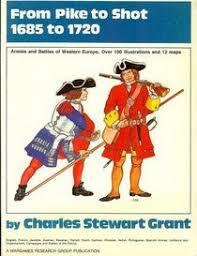 I think I may have found my non grid based companion to the Portable Wargame. This is going to be hugely entertaining. Thus far the only information I have about uniforms of the 1670 to 1720 period is courtesy of the two Helion Titles I recently acquired and that feature Turkey, Russia and Venice. I was also keen to acquire something that covered the mainstream armies of the period (no disrespect intended to Russia and Turkey!) and so was delighted to discover that Caliver Books had exactly what I wanted. A swift email exchange with Mr. Ryan and I am now the proud owner of a copy of the book you see below. The current version. 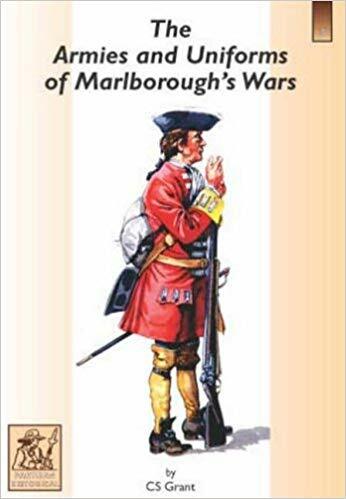 This is an A4 sized hardback and contains the information from both the previous volumes 1 and 2 as well as some additional details from the authors original WRG From Pike to Shot title. This is a peach of a book with some Bob Marrion artwork, line drawings and a few maps as well. The predecessor to the above and one that I should like to add to the collection for completeness. Whilst I have no intentions of producing armies for the more usual protagonists of the War of the Spanish Succession having the uniform details is important for my planned 'imagi-nation' forces for the era. The arrival of this book coincided nicely with me starting to sort out the figures I shall be working with and so I already have a few ideas to play around with. 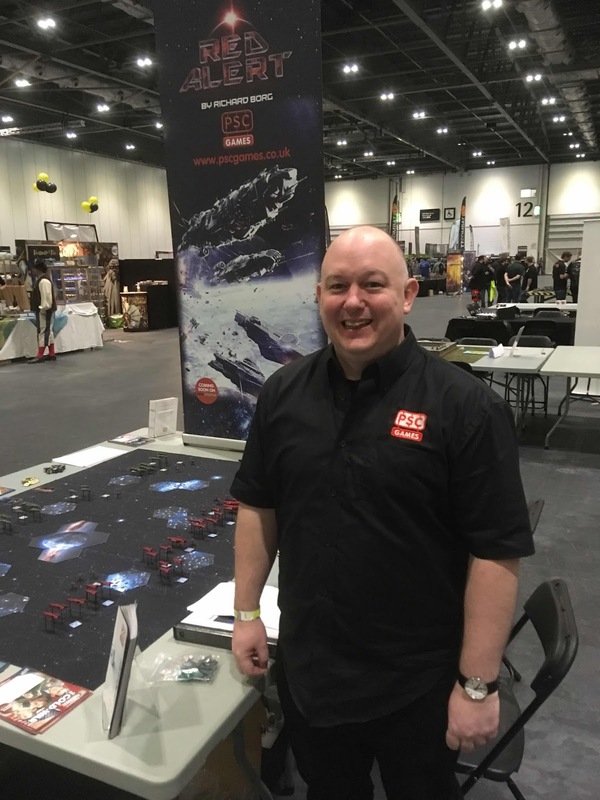 Anyway, casting my mind back to last year I had the pleasure of talking to Dan Mersey (of the 'Rampant series' fame) who demonstrating the latest Command and Colours board game designed by Richard Borg - Red Alert. This is a game of fleet battles in space - a subject dear to my heart - and whilst I did not join the Kickstarter programme for this I was always going to buy a copy when it was released. Lo and behold a year later and the game is finally out and so, by virtue of some canny eBay disposals, I purchased a copy of the game and all the expansions from those very nice people at the Plastic Soldier Company. I say very nice as they threw in a couple of pieces that were Kickstarter exclusives which is handy. I will post a full review in due course and I will certainly be painting the miniatures that are included - all 92 in the base game alone. The expansions add more of the base game models but there is one that I rather liked that contains a space station as well as 8 transports. 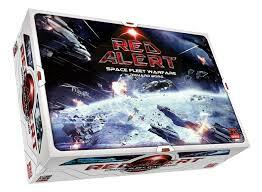 I also rather liked the playing mat that is included with the core set. I have already seen a few comments across social media that suggest these rules could be a good basis for a set of naval rules - not surprising really as many 'space' games are naval battles by any other name. I expect that depending on the popularity of this release that there will be further expansions in due course - the background to the rules mentions a struggle with a race called the 'Krawl' so I would not be in the least bit surprised if they made an appearance at some point. I tend to be a little wary of game specific backgrounds as there always seems to be a feature that does not sit well with me. That is a little odd I know, especially when one is dealing with a fictional setting. 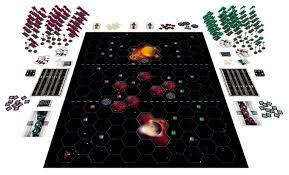 The one that always enjoyed was the background to Ground Zero Games Full Thrust space combat rules. Of course Star Wars and Star Trek feature as being at the very least, well supported in terms of stories. This will provide a very welcome diversion from the unremitting toil of the 18th century and the great thing is that it is pretty much ready to go straight out of the box. Indulgent? Perhaps. Fun? If the recent game at the club was anything to go by then yes indeedy - and I didn't even take part but was merely a curious spectator! Busy week this week with lots going on. To begin with I drew up one of the two lists requested in respect of Eric's collection - this being for the Minifigs component of his Seven Years War set up. The second, that of the 1670 to 1720 cavalry, will take a little longer to do so apologies to those that are waiting on the same. I have to say that although listing the contents of each box (and winnowing out some odds and ends), although taking best part of Sunday, was both incredibly therapeutic and very interesting. the one bog advantage I have with the Minifigs portion is that at least the infantry are easy enough to identify as they have the ID code stamped on the top of the base rather than on the underside. Given that Eric had filed the underside of ALL the figures before organising them into units this was rather handy! A rather useful acquisition scaled at around 15mm. 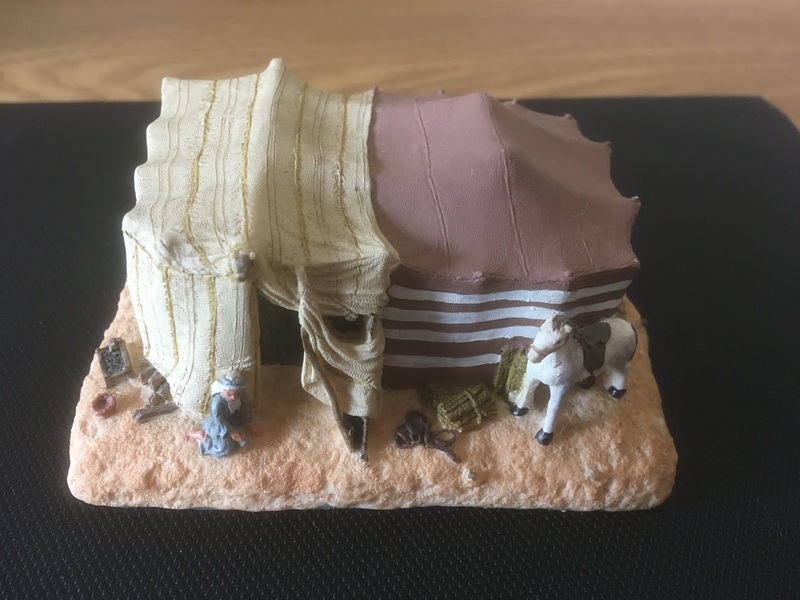 This is a genuine Arabian souvenir and will serve quite readily for my 15mm Arab Revolt set up. It is roughly 75mm by 50mm and has a label on the underside that announces that the model was produced by the Bedu Centre - in both English and Arabic. Aside from the changing of the clocks and the looming spectre of Salute, the beginning of spring also heralds the start of the boot sale season. At present out usual event is not open - it is still a couple of weeks off - so instead Laurel, Holly and I went to the local boot sale just up the road. This is very small by comparison and can be easily looked around in less than an hour. I managed to pick up the above Bedouin tent for the princely sum of 50p. I have a couple of other things to report but these will be best served by dedicated posts so that will be the next two taken care of!